Building at the main entrance. SS Peter and Paul Cemetery. Springfield, Pennsylvania. Monday through Saturday 9:00 a.m. to 4:00 p.m.
August 23, 2018 at Saints Peter & Paul Cemetery, Springfield, Pennsylvania. 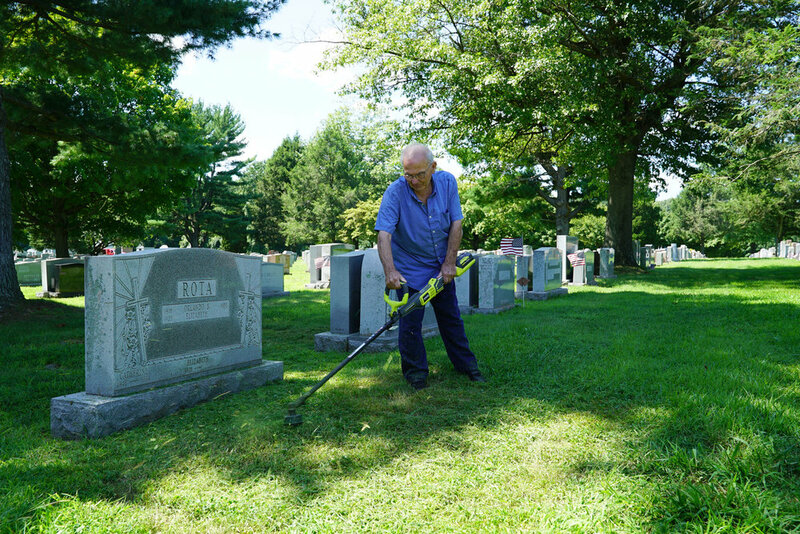 Dissatisfied with the recent grounds maintenance standards at the cemetery, Mr. Rota takes matters into his own hands with his electric string trimmer. SS Peter And Paul Cemetery is a Catholic Cemetery that was established in 1958. 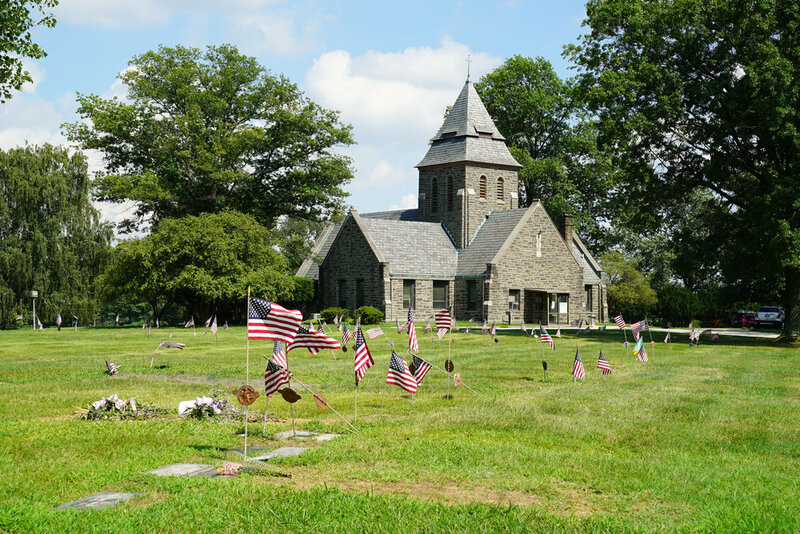 In 2013 the Archdiocese of Philadelphia entered into a multi-decade lease agreement with publicly traded StoneMor Partners to run 13 of its cemeteries in the Philadelphia region. SS Peter and Paul was included in that deal. So this is now run as a for-profit cemetery. SS Peter and Paul is the largest cemetery in Delaware County by size. It comprises approximately 319 acres. It is also the most active cemetery in the county. In 2014, SS Peter and Paul Cemetery had 2350 burials. SS Peter And Paul is one of Delaware County's busiest cemeteries. It's big. It has a track record of being well-run. However, in August 2018 something went very wrong with their grounds maintenance efforts. And the cemetery was the subject of a negative television news report by a local TV news crew. Saints Peter and Paul Cemetery - Springfield, Pennsylvania. August 23, 2018. The grounds maintenance standards have recently declined. October 7, 2018: The grounds maintenance situation has improved. Saints Peter & Paul Cemetery, Springfield, Pennsylvania. This cemetery has short visiting hours compared to other cemeteries. StoneMor Partners strikes deal with Catholic Archdiocese of Philadelphia. StoneMor makes arrangement with funeral services provider. Foundation fees start at $317 for a 2 x 1 foot base. Inscription permit fees are $95. Whether it's an inscription, a setting of a headstone, or a remove and replace of a headstone, you will be required to fill-out a 4 page green form and get it notarized. Also note that though the foundations are already in, this cemetery charges for the foundation when you make arrangements to place a headstone at the grave site. Sections 5, 30, 31, 32, 33: $1995 for one grave lot. This can accommodate 2 burials. Flat markers only. No slants. No uprights. Some sections have limited availability. Sections 21 and 23: $4515 for a 3 grave lot. This can accommodate 6 burials. Upright stones (die and base) are allowed. Section 21 has limited availability. St. Paul section: $4725 for a 3 grave lot. This can accommodate 6 burials. Upright stones (die and base) are allowed. Section 5 cremation lot: $1155. This can accommodate 2 urns. Flat markers only. Private family estate lots: $23,040 for 18 x 20. $76,800 for 30 x 40. Above pricing includes endowed care as of this writing. Holy Savior Cemetery - not yet built. Sign near the front of Saints Peter & Paul Cemetery in Delaware County, Pennsylvania. 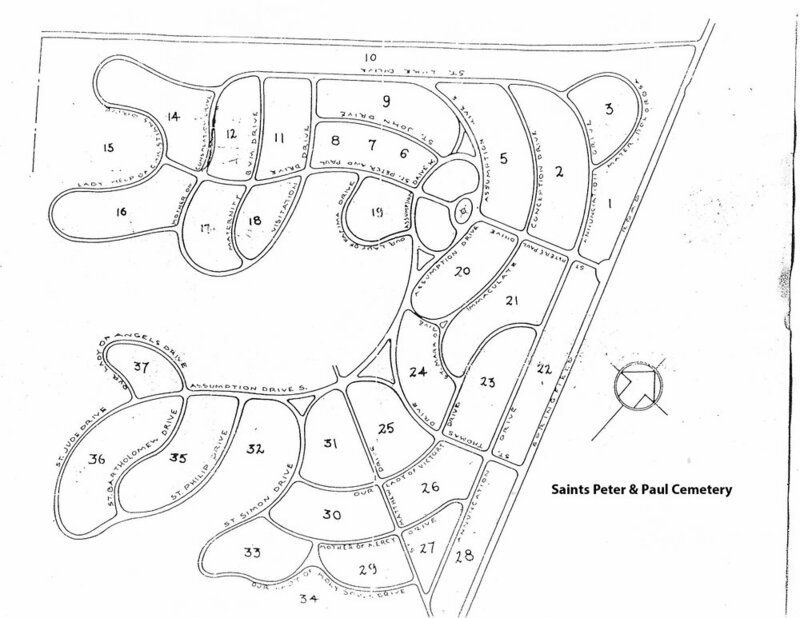 Map of Saints Peter and Paul Cemetery. Springfield, Pennsylvania. 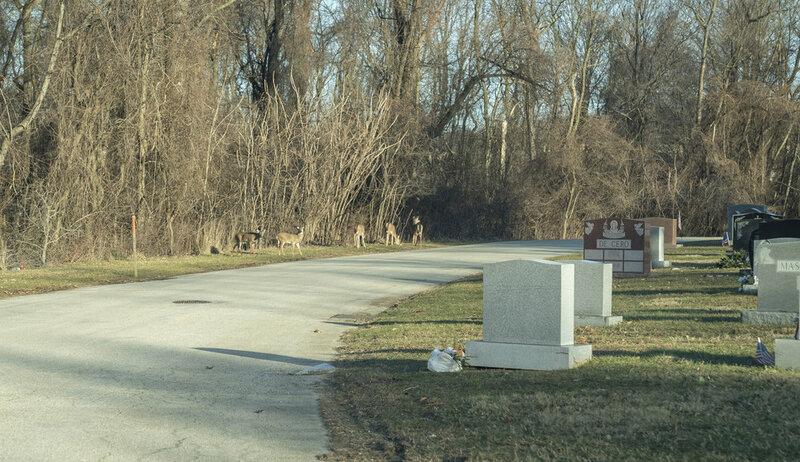 Deer cautiously consider walking away from a wooded area. Saints Peter & Paul Cemetery. Springfield, Pennsylvania.